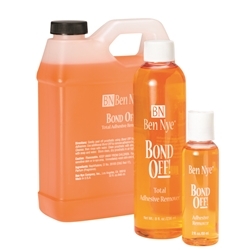 Bond Off Adhesive Remover is Ben Nye's powerful solvent quickly and thoroughly removes spirit gum, prosthetic adhesive and similar adhesive residues from skin and appliances. Follow with Hydra Cleanse or soap and water. Available sizes: .5oz., 1 oz., 2oz., 4oz., 8oz. (With Pump), and 16 oz. Unfortunately, due to FAA regulations this item cannot be shipped Next Day Air, 2nd Day Air, 3rd Day Air, or International.